One is established and highly profitable, the other growing fast and losing money. American Express (NYSE:AXP) and Square (NYSE:SQ) shares have fallen flat so far this year, with the credit card and mobile payments leaders' stocks underperforming the S&P 500. Fans of either company will argue that their near-term performance isn't indicative of their investment potential. But just how true are those claims? To get a better sense, let's examine American Express' and Square's business models, their respective opportunities, and, ultimately, which company looks like the better stock to buy today. The elder statesman of credit card stocks, American Express has been grappling with the challenges from rivals old and new over the past several years. Amid this rising competition, American Express has struggled to meet revenue targets, though its recent Q2 earnings report notably exceeded expectations. The closed-loop structure of American Express' payment networks and the restrictions it can place on merchants -- a Department of Justice antitrust case resulted from AmEx's restrictions on some merchants -- has helped push businesses toward other payment networks, such as Visa. The most significant example is Costco's decision earlier this year to sever its 16-year exclusive relationship with American Express in favor of a Visa card provided by Citigroup. Its card relationship with Costco accounted for 8% of AmEx's total revenue. American Express also lost similar card arrangements with Fidelity Investments and JetBlue. To counter competition from other credit card providers, American Express implemented a number of steps to help drive fresh sales growth and bolster profitability. The company is working to expand the size of its closed payments network, hoping to reach "acceptance parity" with rivals Visa and MasterCard by 2019. American Express is also trying to cater more to small businesses. And it plans to accelerate its marketing efforts going into the holiday season, particularly around its Platinum card. Furthermore, AmEx has announced plans to cut $1 billion in costs by the end of 2017 to augment its margin profile. In terms of the lifecycle of their businesses, Square and American Express couldn't be farther apart. Just seven years old, Square remains in "land grab" mode, spending heavily to capture as much market share as possible amid rising competition. Its bread and butter are local small-and-mid-sized businesses (SMBs) that want a simple, transparent, and integrated solution to meet all their financial needs. To do so, Square has expanded aggressively from its original card reader into providing back-end software and analytics, mobile payments processing, lending, and other services through its proprietary branded platform. The company continues to see adoption at a compelling pace in companies with annual transaction volume between $125,000 and $20 million. This group drove 42% of all Square payment volume in its most recent quarter. As is the case with most businesses of Square's size, the growth company continues to lose money while posting impressive growth. In its most recent quarter, adjusted revenues rose 54% to $151 million from the prior quarter, and its losses continued to narrow. Better still, the company raised its bottom-line guidance for the full- year. Furthermore, analysts expect Square's total revenue to increase 32% and 21% in each of the next two fiscal years. Shifting to valuation, Square's lack of profits make assessing its shares something of an inexact science. The company's GAAP losses are expected to persist for at least the next two years, though it's at least worth noting that Square's price-to-sales ratio sits at 2.3. As such, investors will need to have firmly bought into Square's business model before investing. Especially as competition from rival payments processors such as PayPal intensifies, Square's path to business dominance is no means guaranteed. And the winner is... a tie? 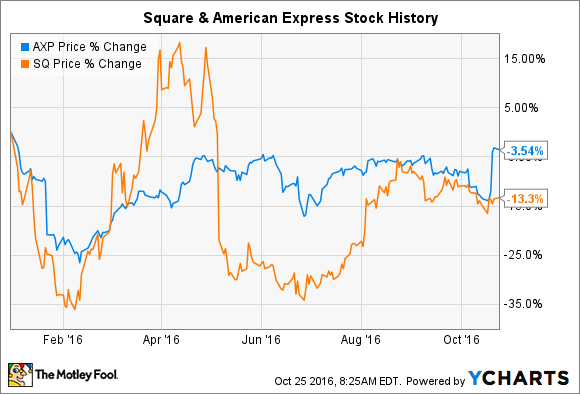 Though the two payments companies couldn't be more different in most regards, both American Express and Square have attractive aspects to their businesses as well as noticeable risk factors. In fact, the average sell-side analyst rates both American Express and Square stocks as holds right now. American Express has a dominant brand, a loyal and affluent customer base, and a plausible medium-term strategy to revive its sales and profit growth. However, the open payment networks of Visa and MasterCard and aggressive courtship of affluent cardholders by many banks are trends that stand in stark opposition to American Express' formula for success. Can it still compete? Certainly to an extent, but the world appears to be changing around AmEx, and I worry that it might be too slow to adjust. Square's risks lie more in its possibly failing to achieve its massive potential. There's no doubt the company has ushered long-overdue changes into the payments industry. However, competitors such as PayPal now also see a growth opportunity to cater to SMBs. Each company has its positives and negatives, which I think makes them both holds at their current levels.